If you’re wondering what that cursed image is, it’s a sculpture representing my facial expression during this entire game. It also happens to be actual “art” sitting on Stanford’s campus. Despite repeatedly allowing tight end seam routes to pick up large chunks of yardage, the defense did enough to expect a win. The run offense managed decently (with over 4 yards per carry when not counting the 4 sacks allowed), but the sub 50% completion percentage constantly caused drives to sputter out. Ridiculous Stat of the Week: 0 sacks of KJ Costello. Somehow they got away with that. I somehow stumbled my way through the first year of graduate school while maintaining this barely functional blog. Round two has just started and I’ll try to keep it going. However, I will be altering the format again. The new format will consist of about two sentences a post (or approximately, give or take 50 sentences). That may seem ridiculously short, but bear with it for one more year. I will be back full force next season. I shall dub this the “Two SCents” format because it’s my “two cents” and it’s two sent(ences). Or maybe it means “Two Scents” for how much this format stinks. Either way I am staying true to this blog’s punny history. True freshman J.T. Daniels makes a shaky first start but shows high potential for his career. The offensive line appears to be the most improved unit of the team as they are no longer committing false starts reguarly and eliminating low/high snaps—perhaps the effect of Tim Drevno’s return…even though he’s technically the running backs coach? 9 yard punt from the USC 46-yard line is sad. Congrats to Chase McGrath for making a record-tying 5 field goals in a single game. The home winning streak continues at 17. Lastly, I still don’t like the renovation. I also can’t find out the exact max capacity with it half finished, but I have heard about 80,000. I’ll try to get a confirmation on that. Ridiculous Stat of the Week: Aca’cedric Ware’s stat line is so perfect, it reads like he’s coding in binary. In another year, this would’ve been a typical Rose Bowl matchup of Pac-12 and Big Ten champs. It also could’ve been a reasonable drive over to Glendale, Arizona for the Fiesta Bowl. Instead we got the Jerry Jones Special Edition because Ohio State went to the Fiesta twice in the past two seasons. Still, it should have been an epic showdown of historic proportions, but turnovers and stout defenses pitched a completely scoreless second half of futility. The coaching on the offensive side failed the team. Don’t get me wrong. Winning the conference is no small achievement. Getting 11 wins in a season isn’t something to scoff at. Only 14 of the 130 FBS teams managed to win 11 or more games. Statistically, that’s less than the percentage of people that get accepted into Duke every year. However, I present you a different angle. Buying a house is no small achievement either. Certainly one should be commended for having the discipline and commitment to save up for a nice home. But imagine Helton and his staff went out with $10 million dollars but bought a 2000 sq. ft. condo in LA. That’s not as impressive anymore. It’s actually kind of disappointing. So Clay didn’t make it to the playoff his second full year as a head coach. Fine, even Pete Carroll dropped a game or two most seasons. No BCS national championship/CFB Playoff isn’t the end of the world. He made it to the Cotton Bowl against an equally talented opponent…then proceeded to showcase an unprepared offense after nearly a month of preparation. Does this mean Clay Helton should be fired? That’s a big time no from me. He definitely needs to reevaluate the staff and make necessary changes, most of which are on offense. The Trojans were basically living in the red zone and failed to score all but one time. Their only score came from a fumble at the OSU 15 yard line. The story of the game can be seen in a single stat line. OSU points off of turnovers: 21. The defense deserves credit for holding Ohio State’s top 10 offense to a crawl. They allowed only 3 points in the first half when turnovers weren’t involved and an unconditional zero points in the second half. Had a game manager approach at QB been taken, the score could’ve been 7-3. Wipe off all of the turnovers and it’s still 0-3 with plenty of opportunities to win. If they turned the ball over on one less drive and managed to scored a touchdown instead, that’s a 14-17 game. Basically, if they had any more ball security and this would’ve been a much closer game. You can blame Sam Darnold if you want. He’s been doing the same thing all season: consistently turning the ball over. Of the 14 games, he’s turned over the ball in 12 games and multiple times in 8 games. His 9 fumbles lost and 13 interceptions make for 22 total turnovers. To put that in perspective, as an individual player, he accounts for as many or more turnovers than 101 FBS teams. He also missed some easier passes that led to the offense stalling out. He played his part in the dormant offense, but coaching did him no favors. The first thing I want to bring attention to is the play calling. As painful as it can be, one of their options is to play Seahawks ball. Run first and only throw when necessary. Punt to pin the opponent deep in their own territory, allowing the defense lots of room to work. It’s not the flashiest way to win (and they have their own offensive coordinator and OL problems themselves), but they win many games against tough opponents. The offense focuses on playing safe and avoiding turnovers and the defense keeps them in the game. If you want to throw and your QB keeps getting sacked, how about trying some screen passes? Move the pocket, try something. I only saw a few roll out passes and only remember one screen pass. Misuse of the clock even when there was a reasonable chance to win the game. They didn’t run plays towards the sideline so that continued to drain the clock. They played slow despite being no huddle. One of the worst offenses was draining the last 30 seconds of the third quarter for no reason. They could have run a few more plays before the fourth. USC has played 6 times against opponents that were ranked at the time. They went 3-3, with 2 lost in embarrassing fashion. Only one was in the top 10. Urban Meyer, quite likely a future hall of fame coach, may not have had his best game or season, but went 4-1, including four top 10 opponents. His team’s loss was to by two possessions to a playoff team. If Ohio State and USC traded head coaches, keeping everything else the same, do you think USC would lose? One thing’s for sure: I’m not going back to Arlington, TX anytime soon. GOOD: Defense. I’ve said my piece about them. BAD: Offense. Four total turnovers, didn’t score on 93% of drives, 8 sacks allowed, and 1 of 4 in the red zone. Despite throwing for 356 yards, Darnold didn’t even have 60% completion percentage and couldn’t make some pivotal plays. In fact, he was barely at 50% completion going into the fourth quarter. Tight end blocking was weak. When have you seen an offense with 413 yards, 23 first downs and only 7 points? BAD: Special Teams. Outside of the muffed punt recovery, the special teams didn’t do well. Punts were short, a short field goal bounced off the uprights, and kickoff returns were bad. BAD: The pointless scuffle at the end. GOOD? : Hopefully the nature of this loss compounded with the same struggles throughout the season gets Clay to make some personnel moves. With the addition of an assistant coaching spot and the departure of Tyson, there are two slots to fill even without any terminations. We could potentially be seeing a very different team next year. I can’t leave you all with mostly bad things, so I’ll find some of the silver linings for you. This is only the 14th 11-win season in all of USC football history and the first since 2008. Thirty years from now, people who didn’t watch these games will look at this on a list of hundreds of seasons and consider it to be a fairly successful season. You can look forward to telling your grandchildren about how the team squandered their talent by slightly underachieving. We can also end the debate about whether or not Tyson was the one holding the offense back with play calling. He already left for Tennessee so the culprit(s) remain on staff. I mean, I guess he could have been part of the problem, but he’s certainly not the sole issue. While the Big Ten had a historic bowl run, the perfection was ended by Michigan. That’s a good thing, not because it prevented a undefeated conference record but because everyone gets bloomin’ onions instead of…coconut shrimp. Depressing Stat of the Week #1: The USC offense allowed 8 sacks in this game. The 2011 USC offense allowed 8 sacks in the season. Depressing Stat of the Week #1 Part 2: In an anomaly, Ronald Jones has more rush yards (64) than the USC team (57). His net rush yards are offset by all lost rush yards from sacks and tackles for loss. Mixed Feelings Stat of the Season #1: USC has the #5 red zone defense. They also have the #121 red zone offense. That 116 rank difference is the largest of any team. Mixed Feelings Stat of the Season #2: As if you needed anymore statistical evidence of the defense carrying the offense, the defense is #22 in the nation with 25 takeaways. USC is rank #121 in turnovers with 27 lost. Typically, re-runs on TV aren’t very good. The rematch between USC and Stanford in 2017 was also a repeat of the 2015 Pac-12 championship game. Both results this season turned out better than that 2015 championship game, so maybe re-runs aren’t all bad. USC’s victory last night won them their first conference championship since 2008 and the first since the expansion to twelve teams. What’s even crazier is that USC had to show the entire South division how it’s done. Despite all the South teams except Utah having an appearance, none of them have been able to unseat a North school. USC would also have the most Pac-12 South titles if that fake-o South title wasn’t awarded to UCLA back in ’11. Speaking of all things 11, it is also USC’s first time having 11 or more wins since their NCAA record 7 straight 11+ win seasons spanning from 2002 to 2008 (a record that Alabama tied this season and can likely break next season). Winning that many games is no strange thing for USC. Where it gets curious is that USC being at 11 wins with a Pac-12 championship and not cracking the top 7. Both Wisconsin and 3-loss Auburn get placed above the Trojans? Even though this was ultimately up to the CFP committee to decide, I feel that the Pac-12 conference has to take the blame on this. So begins my rant. Now, if you don’t like my rants, you can skip ahead to the Doge to read the game summary. Otherwise, you can to enjoy the ensuing tirade. The Pac-12 has the clowniest commissioner in the Power 5—and quite possibly all of the FBS (I don’t know the G5 commissioners at all so I can’t comment on them). The Pac-12 referees have been immortalized in dank memery with things like the Glasses Ref twitter. The conference has been left out of the playoff twice in four years and gets trashed in the first round even when they haven’t. That means 8pm games end at about 2:30am ET. Many east coasters don’t stay up to watch it. Then they don’t vote for the Pac-12 teams in things like rankings, individual postseason awards, etc. Pac-12 Officials that routinely have half the conference in the bottom 10 of penalties per game. It gives rise to talk like “USC only beat one team with more than 7 wins.” Yes, because the conference was busy cannibalizing itself. That’s not even counting all the random weird stuff they do. Stuff like leaving USC out to dry when the unjust sanctions were handed out by the NCAA. Or their failure of a network that still isn’t on DirecTV and doesn’t generate nearly as much revenue as the other P5 conferences. I wonder if people from other parts of the countries look at the Pac and think they’re barely better than the WAC or MWC. An elegant doge for a more civilized age. One where fools didn’t mouth off on the internet. The result of the game was satisfying. This Stanford team was a better than the one SC destroyed in September. The K.J. Costello led offense fared much better than when Keller Chryst was at QB, but still couldn’t get seal the deal. It’s difficult to beat any team twice in one season, let alone one like Stanford, so congrats to Clay Helton and his team for the accomplishments this season. Speaking of accomplishments, one of the features of these championship games is both schools displaying their famous alumni. Stanford listed famous alumni like…”Herbet” Hoover. Damn…as if the man’s name hasn’t been dragged through enough mud. That’s not nearly as embarrassing as their band though. Much to the glee of USC fans (and probably some Stanford fans) the Leland Stanford Jr. University Marching Band’s annoying voice over got cut off—like their NY6 Bowl hopes. GOOD: Darnold was able to complete quite a few deep passes. That earned the respect of the opposing defenses, thus opening up more big runs. He also managed to have a zero turnover game. GOODa: A red zone defense that managed to stop Stanford stone cold at their own game in a pivotal moment. GOODb:The offense then answered with a 99-yard drive for a touchdown. They also had a separate 97-yard drive for a touchdown late in the second quarter. GOOD: Calling a play from under center in a short yardage situation. GOOD: The coaches didn’t force balance down the offense’s throat. They ran more than they passed (43 rush-24 pass) and it worked well. The team averaged a respectable 4.1 yards per carry. GOOD: Ronald Jones gaining 140 yards on the ground. He was only tackled for a loss once the entire game. That afforded him an average of nearly 5 yards per carry. GOOD: Tyler Vaughns somehow jukes immediately after a catch so often. GOOD: Michael Pittman set a career high 146 receiving yards and bailed the offense out of some tough situations. GOOD: Converting both fourth down attempts while stopping Stanford’s. GOOD: Darnold was voted the MVP, but if I was personally deciding, I would’ve given it to Uchenna Nwosu. He was one of the most impactful players on the field. CONFUSED: Stanford fumbled four times but managed to recover all of them. BAD: Same old sloppy mistakes. We also got to see an uncommon handoff going wrong way. BAD: DBs lacking discipline (turning to stare into the backfield, mistiming jumps, etc.) and allow large completions. GOOD: Iman Marshall played extremely well, as did Hawkins, but BAD: the rest had some trouble. The most memorable was allowing a 42-yard completion with 1 minute left in the 2nd half. The kicker was that the receiver was double-teamed with both DBs in position to bat the ball. It wasn’t even like Iman’s cursed bounce two weeks ago against UCLA. GOOD: Having a lead as large as 10 in a tough game. Stanford also never once took the lead in the game. The best they did was tie it at 7-7. GOOD: A 4th-and-2 with a big game on the line was converted to put the final nail in the Kiffin (sorry, I had to sneak that in). Does that ease some of the pain of a decade old 4th-and-2 call by the Kiff himself? All aboard the Lane Train? #CometothefaU? HAHA. Anyway, that was an impressive passing conversion when most teams would be inclined to run it. USC makes it to a Rose Bowl without being a champion in 2016. In 2017, they don’t go to the Rose Bowl as conference champion. The world is a weird place. See you at the Cotton Bowl? On average, USC gets more than 1 penalty every 10 plays. That makes them 115th in the nation for that stat. USC reached a three win streak against UCLA on Saturday night. That ties UCLA’s longest streak this century (misleading stat alert, since there have only been 18 games so far). This is the third such time USC attained a 3+ streak against UCLA in the same time span. USC completes a second consecutive 10-win season…which ties UCLA’s all-time record for consecutive 10-win seasons. Yet the Bruins had the audacity to run out of the tunnel with a flag that said “Champions Made Here.” Congrats on your one national championship back in 1954. By the way, USC has more Rose Bowl wins than UCLA conference championships. USC has almost as many Rose Bowl appearances (34) as UCLA had of any bowl appearance (35). If the flag meant that champions are made at the Coliseum, then maybe they were on to something. I’ll stop rubbing it in now. The win was great, but the process was not. The crosstown rivalry game was heavily penalized and the officials, once again, controlled the pace of the game. There were 23 penalties for a total of 215 yards (12-100 UCLA, 11-115 USC). Why does the Pac-12 want to make football unwatchable? BAD: Third down conversions on both sides of the ball. USC had a measly two third down conversions on ten attempts. On the other side, they allowed UCLA to convert over 50% with 10 of 19. BAD: As per 2017 tradition, USC needed the special teams or defense to score first. Basically, the offenses tied for the first half at 7-7. Neither team scored in the second quarter. GOOD: Pittman’s punt return touchdown was the difference maker for an inconsistent USC offense. BAD: Perhaps the DBs should spend more time checking to see where was the ball was rather than whether LiAngelo Ball made it back from China. To be fair, Rosen was throwing really well, so it would’ve been tough no matter what. I really just wanted to make a ball joke. GOOD: In one of the best plays of the game, a UCLA player managed to tackle his own teammate and incur a penalty in a single move. Impressive! GOOD: Forcing two red zone turnovers. USC currently has the 4th best red zone defense in the nation. BAD: Only rushing for 153 yards against a team that allowed an average of 302.3 rushing yards per game. I get that averages may not mean a whole lot, but being a whopping 50% of the average is astounding, especially when we have great running back talent. The Trojans had the lowest yards per carry against the Bruins all season. Our game actually helped them move up from last in rushing defense to second to last. Stats aren’t everything, but I think this shows an issue in game planning by the coaching staff. SEMI-GOOD: Also, as good as Rosen was, the UCLA offense only scored 23 points. USC was allowing an average of 26.5 points per game before Saturday. That must mean Rosen is a below average quarterback right? Yes, that’s sarcasm. COULD HAVE BEEN WORSE: Darnold’s interception on 4th-and-8 ended up being the same a punt going for a touchback. BAD: More complaints about issues in short yardage situations. BAD: Too many bad decisions that led to wasted scoring opportunities. In particular, wasting time outs early in the first half, compounded by some bad decisions in play calling and by Darnold, led to a drive dying at the 5-yard line as time expired. Even a field goal there would have been better than the nothing we got. GOOD: Uchenna Nwosu is 14th in the nation for passes defended. He is only one of three linebackers in the top 100 and the only linebacker in the top 60. GOOD: A great tackle by a great kicker, Reid Budrovich. GOOD: Matt Lopes getting the stylish over-the-shoulder onside kick recovery to end his senior night. UCLA made a huge mistake there. They should’ve trusted USC’s offense—to fail—rather than making a risky onside kick play. With that, we get to sit around for the “bye week” as we await the results of the Pac-12 North. The Trojans will face either Stanford or Washington State on another annoying Friday game. Stanford’s win eliminated Washington as a Pac-12 North contender due to the head-to-head record. The decision will be made from the annual Apple Cup. If Washington beats Washington State, Stanford will be USC’s opponent. We’ve got various media outlets reporting that the student section was chanting “one more year” at Darnold. I was in the student section and I heard none of that. Maybe I wasn’t close enough to the front? I will say that I was shouting “one more Tusk” and got a people to join in, so maybe they misheard us? I’ll take credit for bamboozling everyone. Meaningless Stat of the Week: In the last 10 USC-UCLA rivalry games, USC has scored exactly 28 points five times. What does this mean? Illuminati. Always the Illuminati. For only the second time in the past 10 season, USC has gotten under 20 first downs by penalty. The only other time was 2009, when it was 10. Currently, the Trojans have gotten 9. Meanwhile, opponent first downs by penalty remains a fairly reasonable number. USC is actually last in the nation in receiving first downs by penalty. Stats don’t tell the whole story, but maybe there is some merit to the officials being extra biased this season? With the win against Colorado, USC has clinched the Pac-12 South for the second (third) time! USC previous won in 2015 then lost to Stanford in the championship game during Helton’s second interim stint. For those who remember, the Trojans also commandingly won the South in 2011, but the inagural championship game featured South runner-up UCLA and Oregon, both of whom USC beat in back-to-back weeks leading up to the this sham of a game.The Trojans have a good shot of being able to win the conference (if they can be consistent). It would be the first time in the Pac-12 era and the first since Pete Carroll left. The Trojans will have a bye week leading up to the championship game, but probably won’t know their opponent until the regular season closes up on 11/25. Half of the north still have a shot to win it. Washington, Washington State, and Stanford could all conceivably face USC on December 1st. GOOD: Two of the younger receivers, Pittman and Vaughns, made a big impact this game. BAD: The refs taking the time to review a first down early in the game. They then decided to change the call from the field afterwards. Even the commentators were unhappy with the process. GOOD: The special teams unit impressively made two field goal blocks. GOOD-BAD: The fumbling problem reared its ugly head again. Both Jack Jones and Sam Darnold fumbled, but managed to recover them instantly. It looked like they were trying a basketball dribble. Maybe they just wanted to commemorate USC basketball’s season-opening win against Cal State Fullerton. GOOD-ISH: Ajene Harris’ second interception and attempted lateral could’ve been such a beautiful play had he gotten it out a split second earlier. Nonetheless, that was fun to watch. BAD: Allowing a punt to be blocked, setting up an easy touchdown for Colorado. BAD: The team is still unable to convert in short yardage situations. That leads directly to their low third down, fourth down, and red zone conversion numbers. GOOD: John Houston’s touchdown-saving coverage reflexes in the end zone was quite impressive. Two plays later, he hit the CU QB for a 5 yard loss on fourth down to effectively end the game. GOOD: Darnold had a third straight decent game. GOOD: Ronald Jones had another great game. He has beat all his previous season rushing yard totals with three games to go (UCLA, Pac-12 CG, Bowl Game). BAD: Missed field goal and PAT. Chase McGrath’s injury seems to be affecting him a lot. BAD: Continued inability to close out games. RIVALRY WEEK IS THIS WEEK. CONQUEST AT 5PM ON THURSDAY. USC remains undefeated against the Colorado Buffaloes. This win puts them at 12-0 all-time. Weird stat of last week: I’m kicking myself for missing this last week (it’s okay though, because all the kicks got blocked anyway), but the I’ll chalk it up to an Illuminati cover up. Ronald Jones broke 1,000 yards after the game against Arizona, sitting exactly 1,082 yards. His 2016 season total was 1,082. NEED I SAY MORE?! RoJo, why have you joined them? So you might have noticed that I missed a week. Something that hasn’t happened since I started this blog. My apologies to all my loyal readers. The busyness just caught up to me. But did you really need anything from me though? It seems the close of the first half of the ASU game was enough of a joke by itself. I can’t even write content as good as that. Still, I feel I owe y’all something. GOOD: Perfect throw and catch by Darnold to Deontay for the first touchdown. That’s the factor that’s been missing from the offense for most of the season. BAD: One of the OL almost sacked his own QB. CONFUSED: Darnold fumbed…but since it was on fourth down and immediately recovered…did it matter? GOOD: Good use of RPOs and read options. GOOD: Uchenna Nwosu shutting down an ASU drive, basically all by himself. GOOD: McGrath making a career long 51 yard field goal. GOOD: Tyler Vaughns smooth moves after the catch. GOOD: Steven Mitchell’s box out block to spring Ronald Jones for a touchdown. CONFUSED: Extended first half. After the Hail Mary attempt by USC was ruled down at the 1, the officials signaled that time had expired. Both teams started to head to the locker room before they decided they should probably review it. By the time they changed their ruling, USC’s team was nowhere to be found. An angry Helton, made the officials go and grab his team. One lone referee made his way to the locker room…down the wrong tunnel. The SC players ran out of the other tunnel, doing the whole pump up routine probably to amuse themselves. The Pac-12 being the Pac-12 had to throw a flag on the ensuing PAT attempt. Now I’m finally back on track. I wish I could say the same about the Pac-12 conference. The already atrocious scheduling (like 12 straight games, Friday road trip after a road trip, two 7:45pm games in a row) was made so much worse by the officiating. Remember how I commended Mark Duddy and his crew for what a great job they did in USC vs. Cal? I take it back x1000. Perhaps Mark Duddy read my blog and decided he wasn’t having any of that. I was ruining his good name amongst his fellow Pac-12 associates. He has a reputation to uphold, and gosh darn, those flags will be numerous and biased. He sure showed me. It got to a point that students were throwing up yellow towels mockingly after every penalty. Flags were thrown for phantom penalties or ticky-tack in nature. What made it worse was that the refs would wait until seeing the outcome of the play before throwing the flag. The Trojans were called for 5 offensive holdings and 1 defensive holding. Arizona got called for 1 offensive holding…which was offset by a USC penalty. Seems suspicious. Putting that up against the total penalty numbers of 14 for 123 yards versus Arizona’s 3 for 32 yards makes it look even more problematic. Then there were the reviews that took a while to initiate and a fair bit of which were incorrect. At one point, Helton had to run onto the field to try to get attention for a review. He was flagged for that too since he a sideline warning had been given earlier in the game. Despite the ref being right by the letter of the law, no sane referee should flag that. Those 18 yards at the beginning of the third quarter moved at a snail’s pace. It must’ve been 20 minutes of real time for those pitiful 18 yards ending in a punt. I thought I was watching a World War I documentary about trench warfare. By the start of the fourth quarter, the East Coast had hit the daylight savings time change. Who’s crazy enough to watch that, especially if it wasn’t their favorite team? BAD: Two red zone trips with no points? USC has had red zone troubles all year. Some of it is being unable to convert short yardage situations. GOOD: The defense held Arizona to a pair of field goals for over two and a half quarters. BAD: Defense getting tired after ridiculously drawn out game. Part of the reason that Arizona made such a furious comeback. GOOD: John Houston had an interception made of dreams. GOOD: JuJu Smith-Schuster joined the student section in the stands late in the fourth quarter. USC still has a formidable streak intact. They are 15-0 at home, dating back to 2015. The last time they lost in the Coliseum was the game that eventually led to Sark’s dismissal. USC leads the nation in sacks (34). USC is the second worst in the conference in allowing fourth down conversions. Only Oregon State (arguably the worst team in the conference) allows more of them than USC (69%). Do you remember the last time USC didn’t score in the first half? At Corvallis in 2010, where the Trojans lost 7-36 and starting QB Matt Barkley had to be taken out with an injury. Seven years later, the #11 Trojans played about as well as the unranked Temple or Boston College against the #13 Fighting Irish. If you combine this game with USC’s 2013 trip up to South Bend you might get a full game’s worth of scoring! Any hope at an outside shot of a playoff berth has been ended. Now fans are forced to adjust their expectations and are uneasy about the rest of the season. No matter how good a coach is, eventually they will lose—maybe even a team that they have no business losing to—but a prepared coach shouldn’t really get blown out often. Not at this level. Not with this kind of team. The team gave up. Hell, it looks like they were never really into it to begin with. The team looked completely unprepared and unable to tackle. From what I’m seeing, I’m guessing they stopped tackling in practice. Sources confirmed that. Hasn’t Helton learned from the mistakes of his predecessor? He worked directly under Kiffin when he made that same unfortunate decision. Uncoincidentally, it’s starting to look like that 2012 season; a depleted roster edges out unconvincing wins through sheer talent, but ultimately squanders the season due to poor preparation and coaching decisions—only Kiffin didn’t get blown out that season. BAD: The punt return game. They made a change, like I wanted them to do. It resulted in another unforced turnover. You’re telling me the entire roster doesn’t have anyone that can reliably field punts? BAD: The missed field goal almost got overshadowed in my mind because of all the other things that went wrong. A 27-yarder should not be that difficult. BAD: Could not establish a run game. BAD: I could list more but who wants that? GOOD: Fink showed some good runs. GOOD: Deontay had a great game despite his quarterback struggling. As bad as that was, firing should not be on the table at this point. A third midseason firing, all within 5 years ,at a school that had previous not done it before, would be disastrous. Firing the guy at the end of the season might be hasty as well. He should get about three years. If he fails to make the necessary changes this offseason, then that’s the point when those considerations should start. Depressing Stat of the Week: USC averages 2.71 turnovers a game. They have not had a game with less than two turnovers this season.They are tied for 127th in the FBS for total turnovers (19). The only team that has more turnovers that SC is San Jose State. So this post comes unbelievably late, even by my poor standards. In my defense, I was busy struggling through studying and struggling through my midterm. Kind of like how USC struggled all the way through this game against Utah. 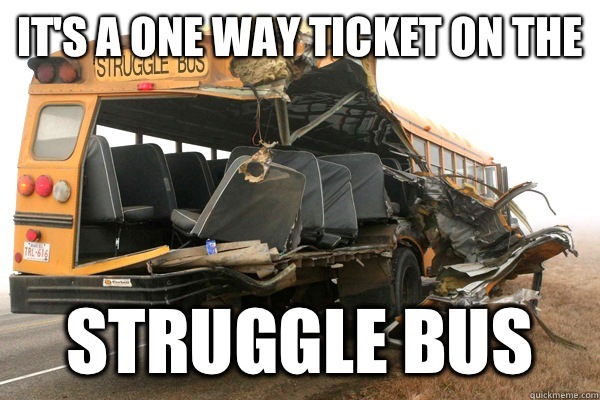 Clearly the struggle bus is a malady that affects all. The problems started with some early fumbles—one leading directly to a touchdown. Three first half fumbles by a single player is quite concerning. That’s almost half the first half offensive drives ended by lack of ball security. But hey, at least there were no interceptions! this might’ve been a different game had Utah not missed that medium length field goal. I must admit that there were a lot of distractions for me during this game, so my analysis it sorely lacking. I barely have time to write this so y’all can forget about me watching plays frame by frame like I used to do. Speaking of time, there’s a bunch I’d like to get back from those officials that saw fit to measure for the first down like 3 times in the same set of downs. They had so many measures, the band almost thought it was their sheet music. GOOD: The defense didn’t allow any points in the second half…until the last minute. They also managed to stop a potentially game-winning two point conversion. GOOD: Scoring 21 straight points to take the lead. GOOD: Darnold played an acceptable quality in the second half. GOOD: Tight ends are finally getting more involvement in the offense. Here’s a stat for you: 75% of USC’s touchdowns came from the tight end position group. GOOD: Punter, Reid Budrovich, continuing to field bad snaps. BAD: Obviously, the other side, stop snapping so badly. This ain’t bowling. The ball needs to leave the ground. BAD: Only having 49 rushing yards at the half. GOOD: The run game picking up in the first half. GOOD: Only three penalties for 35 yards—one of which was absolute garbage and not a pass interference. GOOD: Tyler Vaughns, bailing out the team on fourth down again. Don’t be greedy. I already spread some stats throughout the post. Turnovers off of Turnovers: We got another one this game! How exciting! You see those people hiding from the sun there at the edge? That’s the kind of day it was. Did USC win? It’s hard to tell with all the negativity still going around the fanbase. Some of it is warranted. Remember that sequence where USC fumbled and Oregon State missed a field goal? Then USC fumbled and Oregon State missed a field goal? Then USC fumbled and Oregon State missed a field goal? Then USC fumbled and Oregon State missed a field goal? Then USC fumbled and Oregon State missed a field goal? GOOD: Jack Jones getting the students some Chick-fil-A…err, I mean blocking that kick. BAD: Getting a personal foul penalty on a perfectly clean hit just because the Oregon State player failed to secure his own helmet. GOOD: The Oregon State player that thought he was so cool for catching “touchdown” pass that he felt the need to talk crap. Had it actually been a touchdown, then the penalty would’ve been assessed on the following kickoff. Much less costly. Instead, he got them pushed back to the 15. BAD: Lucky for him, they ended up scoring that TD anyway. BAD: Punt return game. I was never impressed with it, but this was the last straw for me. I would make a change at this point…if I had any influence. GOOD: Backup QB, Matt Fink, getting to the endzone in an impressive run. GOOD: Always good to get Jake Olson in the game. He gets to look like a boss on the broadcast. GOOD: Finally some garbage time. It shows that the team actually had a secure enough position to start playing back ups. The last time was probably USC-ND back in 2016. BAD: Oregon State is probably one of the worst, if not the worst, team on their schedule. The win was never in doubt, but they made it painful. If the same thing keeps happening, it’ll be a hard fought game against Utah next week. USC can’t seem to score without the help of a turnover (counting missed/blocked field goals). Heck, they can’t even score with the help of them sometimes. The offensive coaching staff continues to field a product offensive to the fans. This must be what they tell Darnold to do on all the RPOs and read options. Depressing Stat of the Game #1: Total 1.5 turnovers per quarter. Messy game to watch. The first quarter had three total turnovers and two missed field goals. Depressing Stat of the Game #2: Despite running only once, Fink has second most rushing yards by an SC player this game. The second “run” credited to him was recovering a fumble for a gain of 1 yard. Misleading Stat #1: Fink has better TD:Turnover ratio than Darnold this game. 1:0 compared to 3:3. Misleading Stat #2: Fink has 100% completion on the season.